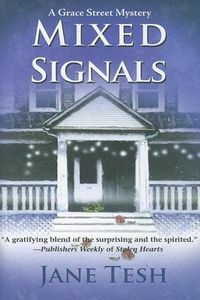 Mixed Signals by Jane Tesh: Synopsis and Online Purchase Options. Synopsis (from the publisher): It's Christmas in Parkland, North Carolina, but PI David Randall is not partaking in the holiday cheer. Years ago, Randall and his psychic friend, Camden, found Jared Hunter stabbed to death. Now Camden is being haunted by flashbacks. Do the flashbacks suggest that Camden is somehow linked with his friend's killer? Among the suspects is Boyd Taylor, Randall's client. Investigation reveals that Jared had served time for breaking into the Parkland Museum of History. Bert Galvin, son of Ralph Galvin, the editor of the Parkland Herald, was also involved. And what of the inept superhero, the Parkland Avenger? Could the Avenger be a set up by award-hungry Herald reporter, Brooke Verner? The Super Hero Society of Parkland insists the Avenger isn't one of them.